Now, a little analysis of what's happening here. As you've seen above, one of the biggest problems for modern users was the lack of multiple Undo actions. This is because modern Photoshop versions (since the early 2000s, I believe) have had a History Panel, essentially a large stack of Undo-able actions, organized and logged nicely. Another big "missing feature" is live preview (moving sliders and seeing the image adjust on the fly), which likely wasn't possible given the limitations of the hardware and its operating system at the time—this was why Photoshoppers typically saved the file after every major edit, to myfile-1, myfile-2, until the puny hard drive was full. Oh yeah, and there were no layers; layers have been fundamental to how Photoshop has been used for decades. The final area that's really rough is how Photoshop 1.0 dealt with typography; it rendered the text straight into the image, chunky pixel edges and all. Ugh. But still...this was a professional tool (and an amazing one) 25 years ago, and it blew our minds at the time. On the flip side, it's impressive to see how similar many of the control panels are to the original, even so much later. 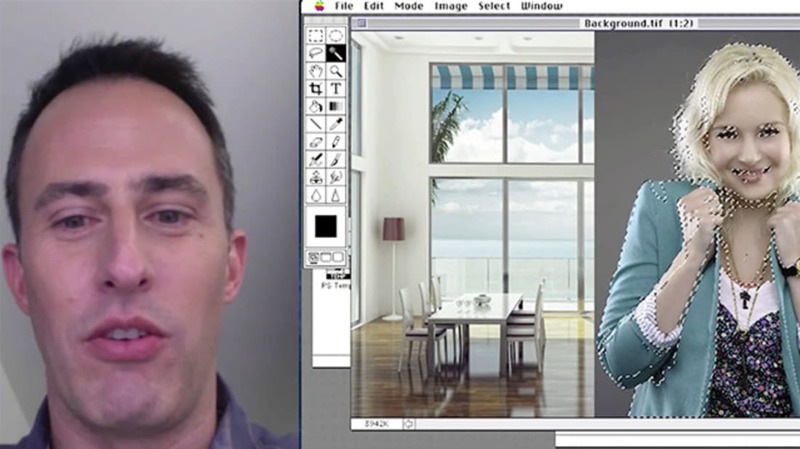 Decades of refinement have not erased the original character of Photoshop. * = Technically, the first version of Photoshop shipped in limited quantities in 1989, bundled with some scanners. Adobe seems to have picked 1990 as its first year, likely because it was broadly available as a standalone program at that point.